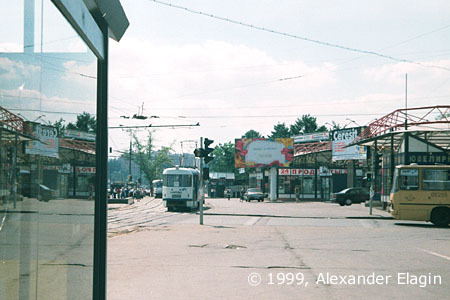 A tramline formerly lined along Prospekt Mira near the All-Union Exhibition Centre (VDNKh) was relocated to a parallel street (namely Prodolniy Proyezd) in August 1999. 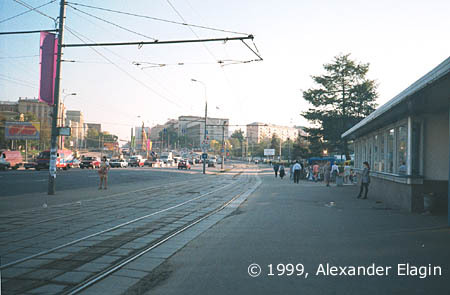 This part of the line avoided the fate of the other stretch to Rizhskiy Vokzal which had been permanently closed and lifted. Now when the reconstruction is over its fruits can be easily seen by everybody who visits the Exhibition Centre: an elevated section of the Prospekt changes the underground one. As for the tram - it feels good; unfortunately, the closest stop is today someway more distant from the Metro entrance than it have been before, but this change had practically no influence on the line patronage. 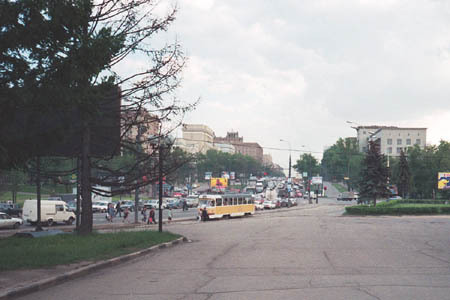 Prospekt Mira at the crossing with Zvyozdniy Boulevard, looking south towards the city centre. The same place twelve years later. 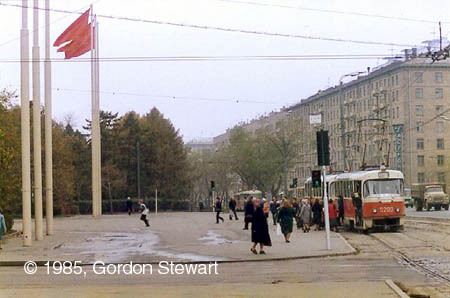 As you can easily see, the car traffic became horrible, but the tram line is still in place. A year later the newly built Metro entrance would be built right at this spot, but this very comfortable transfer point would not exist too long. Prospekt Mira at the south entrance of VDNKh subway station built in 1998. One week have passed since this line was closed, but the rails still shine. There are some construction works in the background - the elevated highway section is to be built. This view across Prospekt Mira partly displays all the landmarks of this Moscow district: a monument to the space explorers and Ostankino TV and radio tower. 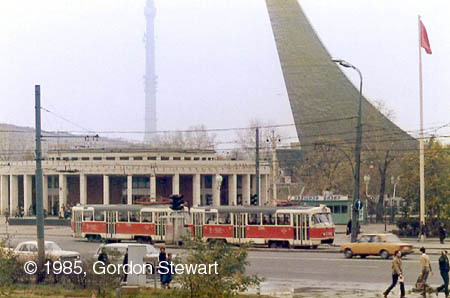 And, of course, the round pavilion of the Metro entrance with a tram line in front of it. 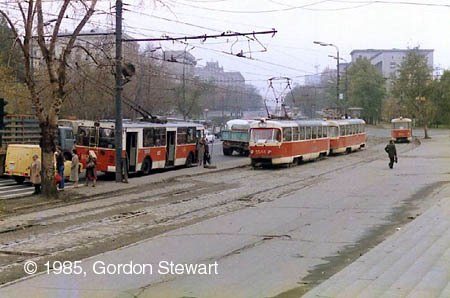 Another view of the same tramstop, now looking south along the line. The round pavilion of the Metro entrance is in the same place, but the view is obscured by multiple booths. 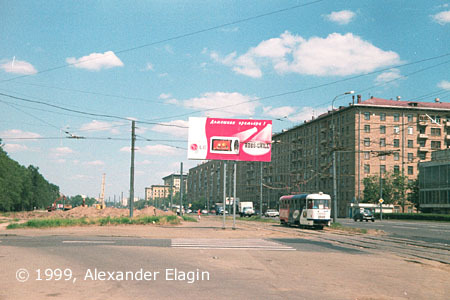 The shining surface in the left part of the photo belongs to a steel-and-glass tram stop shelter, widespread in Moscow. 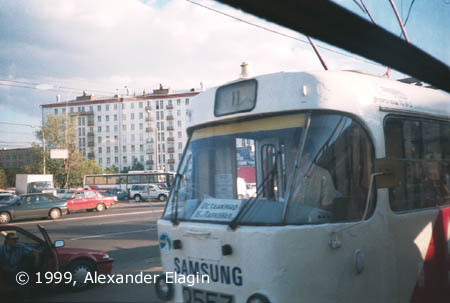 The route 11 tram near VDNKh subway station, viewed from the tram window. This shot was taken in the last day of the old line. Two days later when track switching had been over the new line along Prodolniy Proyezd was put in service. And again the same stop (in fact, not exactly the same - now the southbound one), yet lacking a glass booth. The stop is marked only with a tableau hanging on the overhead.